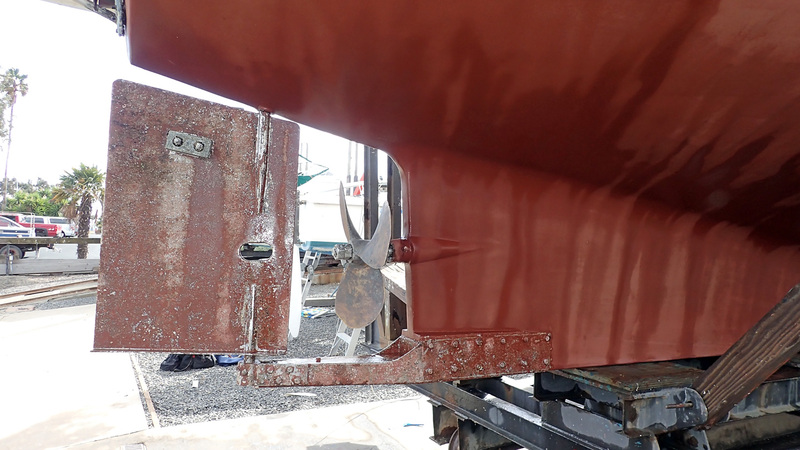 Lady Di is the ground-breaking hull number one that launched the Krogen 39 phenomenon. 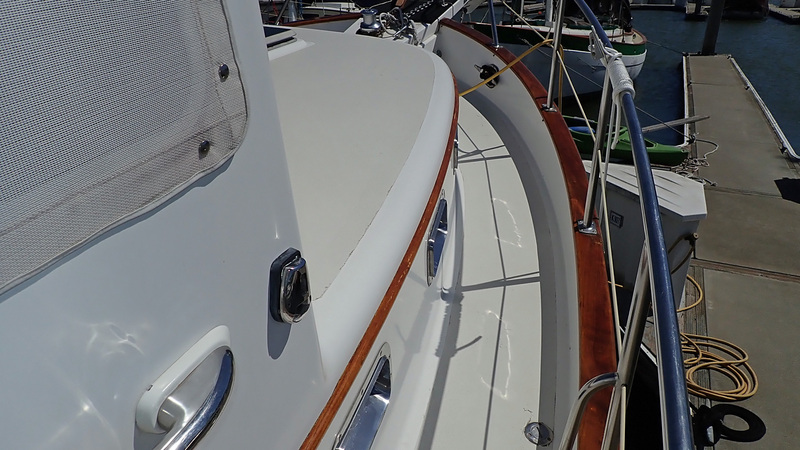 She was delivered in 1998, wow, twenty years ago! 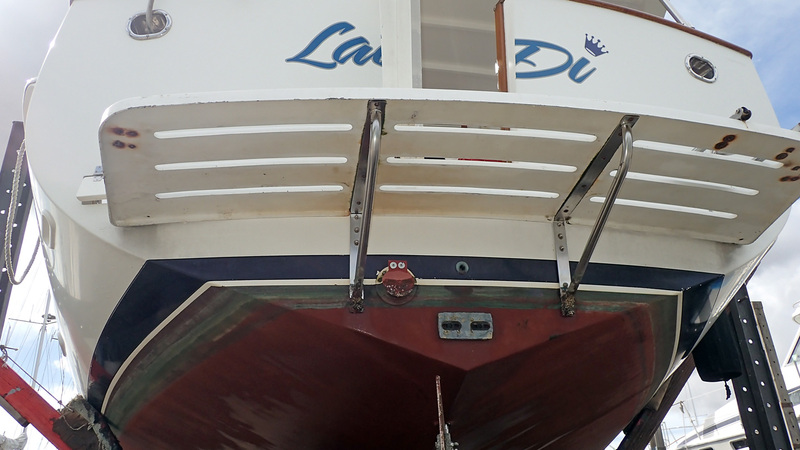 You can’t judge a book by its’ cover and the same follows for Lady Di, (except her cover and all of the pages inside look much newer looking than her model year proclaims). 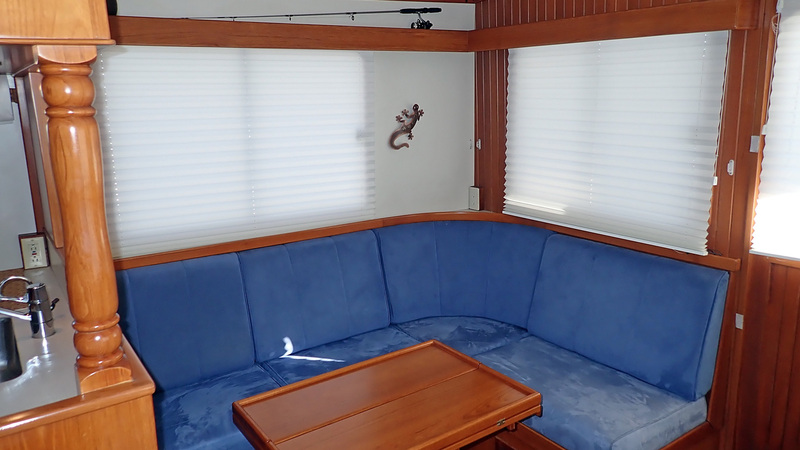 Economical, efficient and practical, Lady Di is a very appealing choice for first time trawler owners or for sailors who are ready to make the trawler transition and are looking for the room and space more equivalent to accommodations found in a 45’ sailboat. 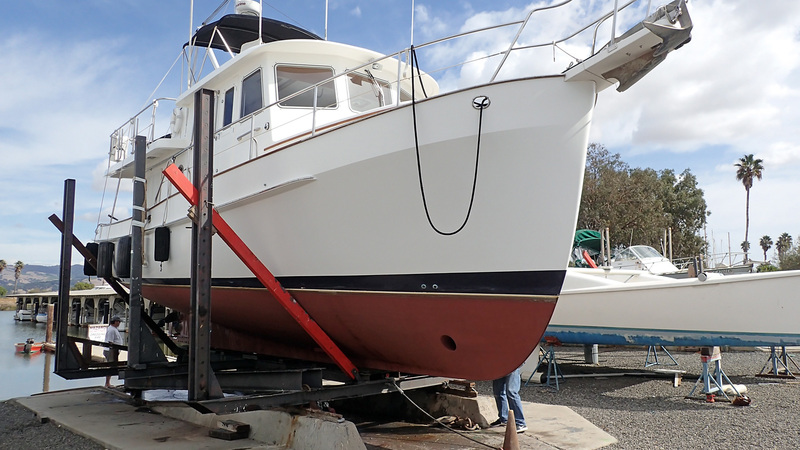 Lady Di was purchased in 2017 by her third owner who attended to all of the survey recommendations and has had her systems and machinery all serviced for cruising. 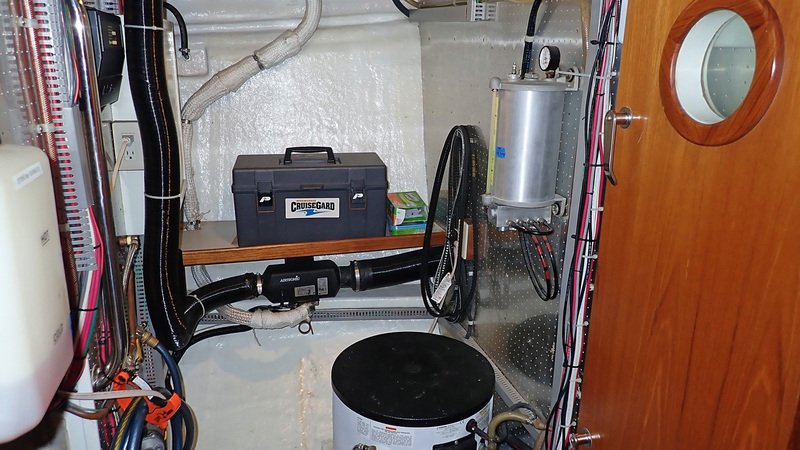 With the survey projects completed (including a new main engine shaft, bottom paint, propeller tuning, etc.) 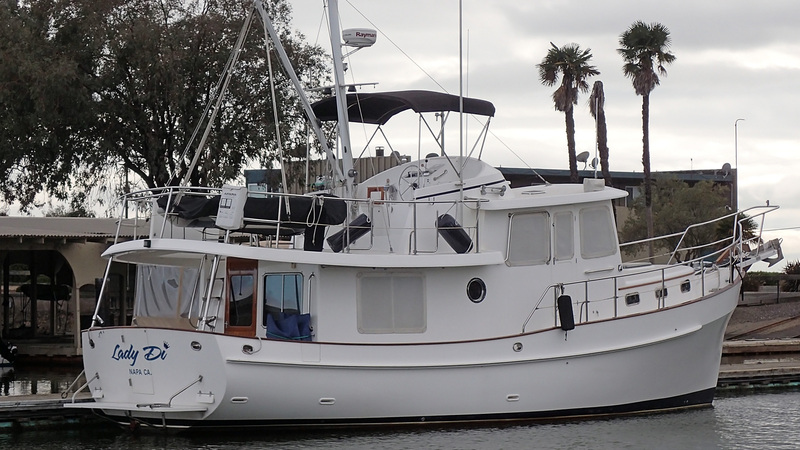 they have recently settled in to enjoy her – only to realize that the boat they bought may be ideal for two people; but when their grandkids come aboard they are short on sleeping accommodations. 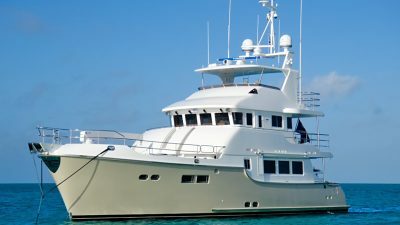 For this reason alone, they have decided to sell Lady Di and are already looking to purchase a similar quality trawler when they find one a bit larger and with a true second stateroom. 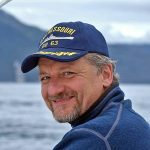 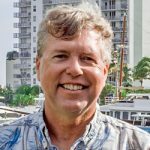 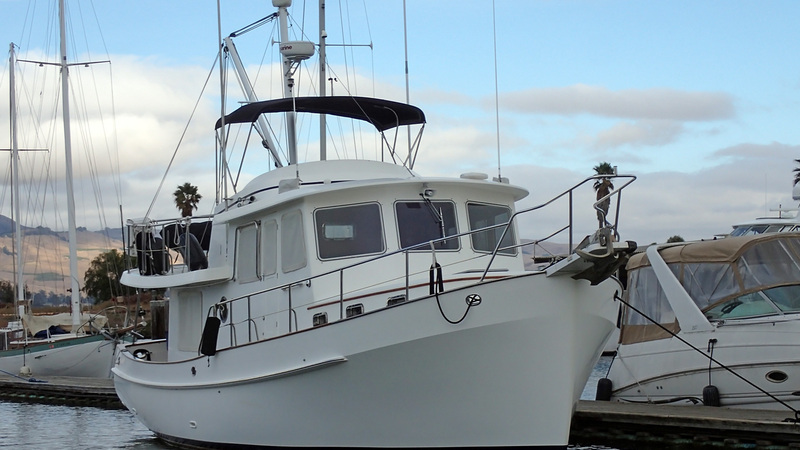 Designed by Jim Krogen (senior) to be an offshore, ocean crossing livable trawler for two people, the Krogen 39 has exceeded that goal. 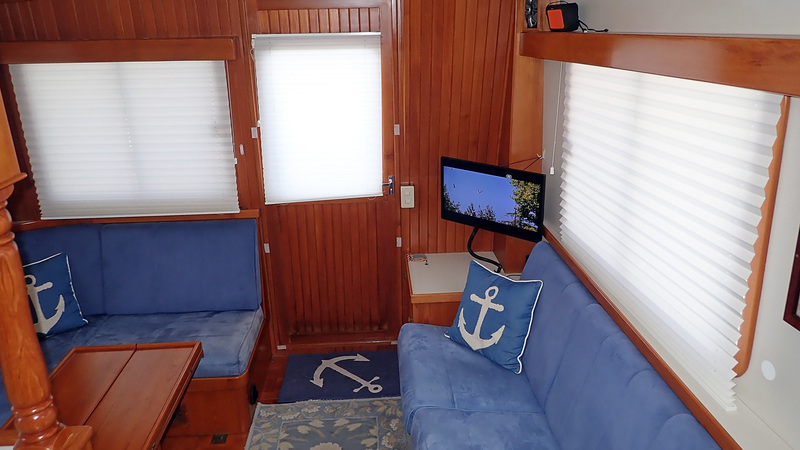 She is both compact (for marina slips) and large (spacious interior volume including standing headroom in the front of the engine room) at the same time. 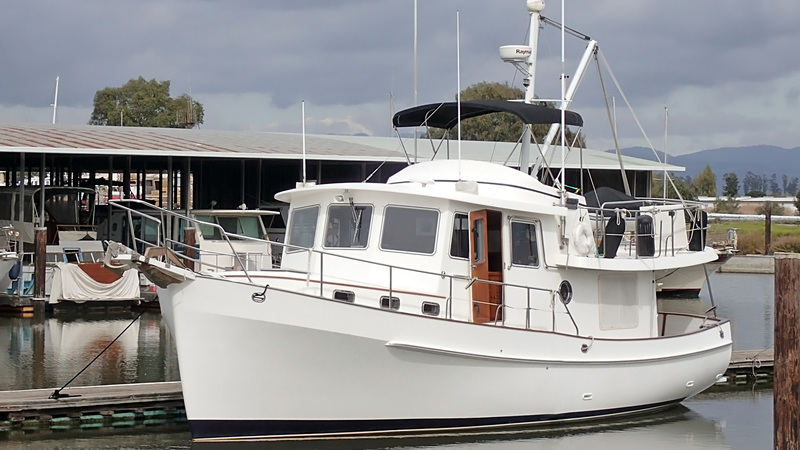 Easy to dock with her refined hull shape including wine glass transom and fitted with a bow thruster this is a single engine trawler that is easy to handle. 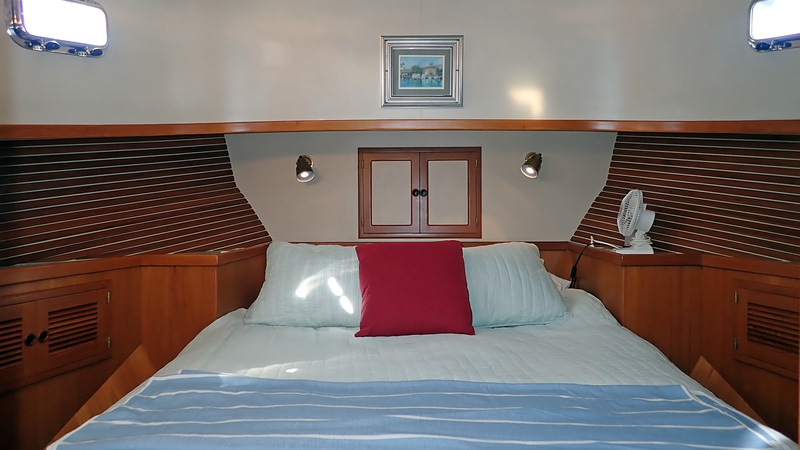 Her exterior; swim platform, covered cockpit, side decks, foredeck, boat deck and flybridge provides a variety of outdoor living space. 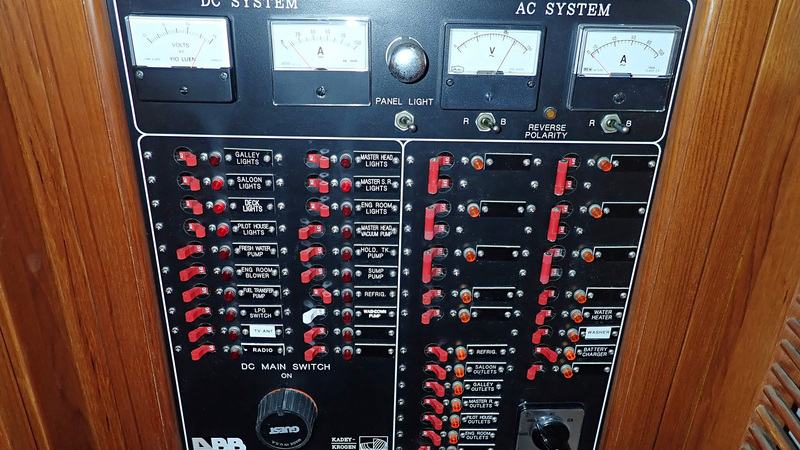 From the beginning, the systems on Lady Di have been purposely minimal. 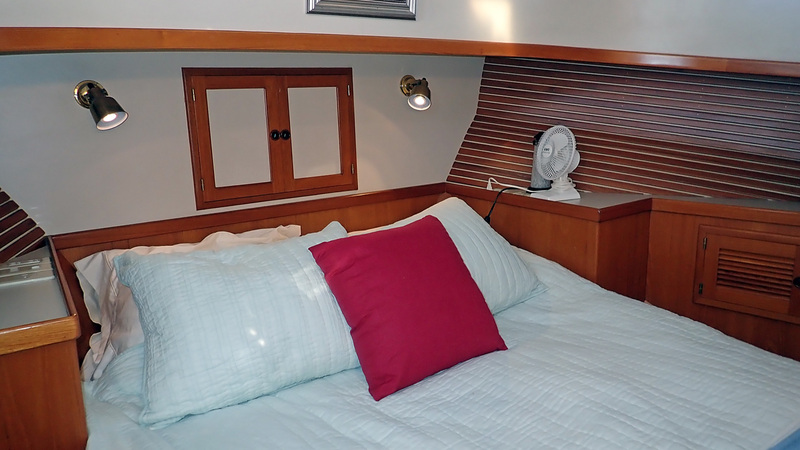 She is a back-to-basics boat that includes the essentials favored by three owners now. 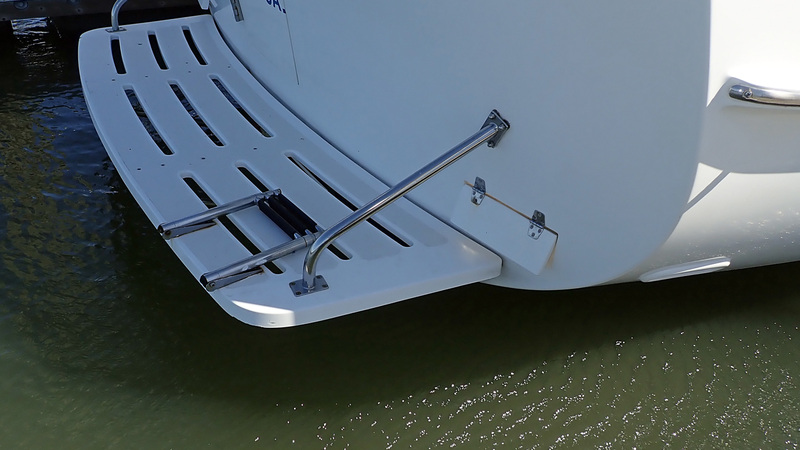 Simple, understated, exceptional. 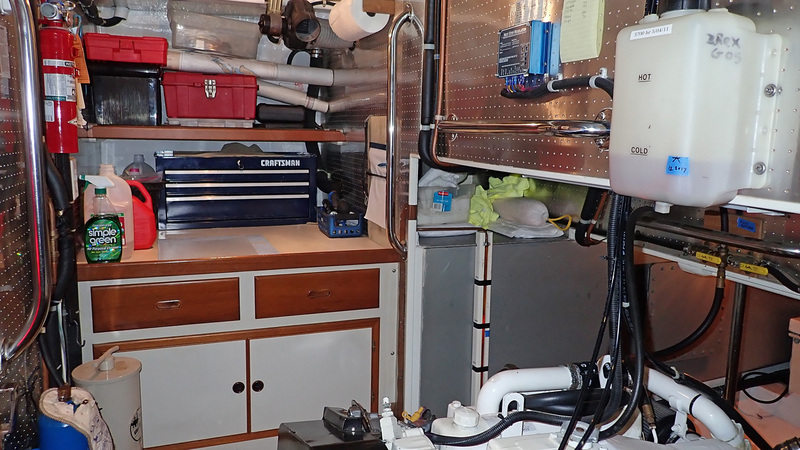 The Krogen 39 is a very good secret that is still not as well-known as she should be. 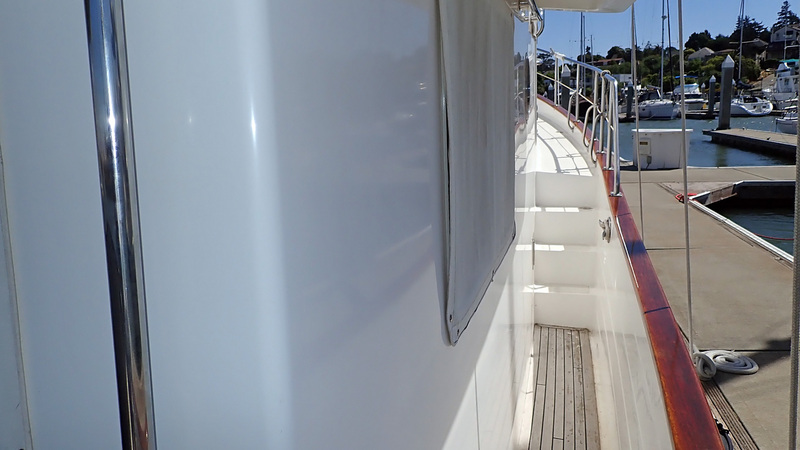 Lady Di has been looked after with regular and caring maintenance, she is as dependable as she is reliable. 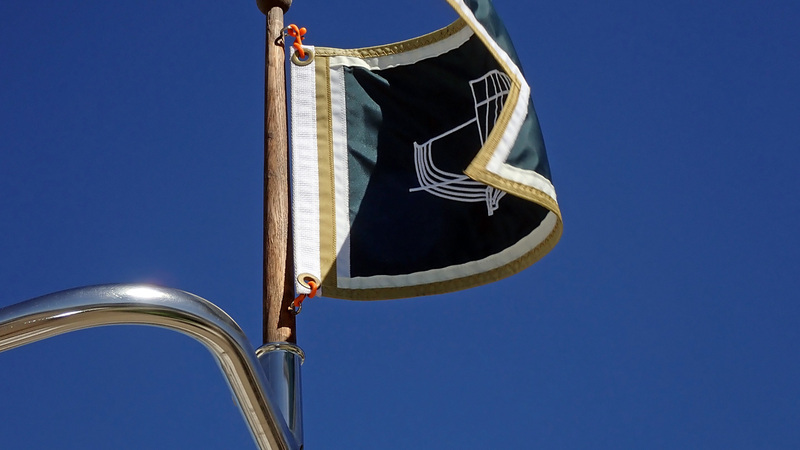 The Kadey-Krogen line is very popular and celebrated for their seakeeping abilities. 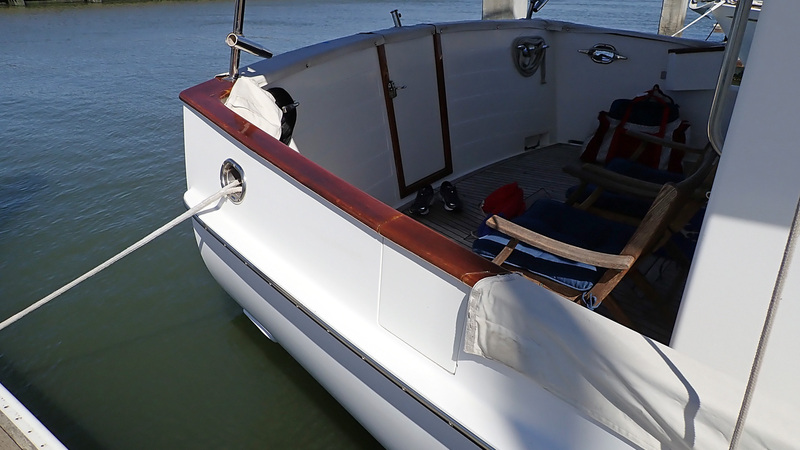 The brand is famous for their gorgeous finish: glistening gelcoat, sparkling stainless and beautiful teak timber throughout. 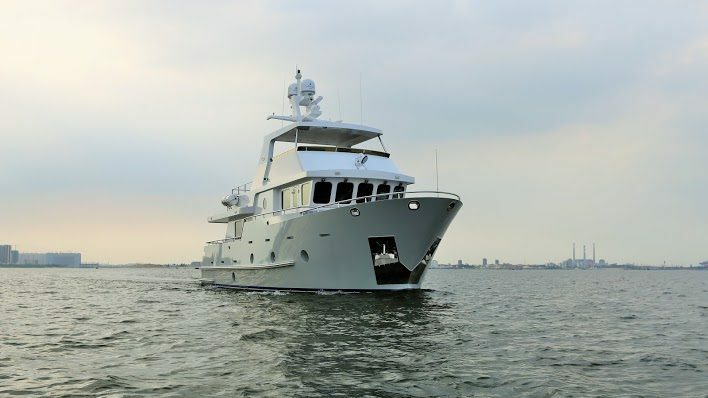 Lady Di is the equal in elegance to her larger siblings all hand built by Asia Harbor Yacht Builders in Taiwan. 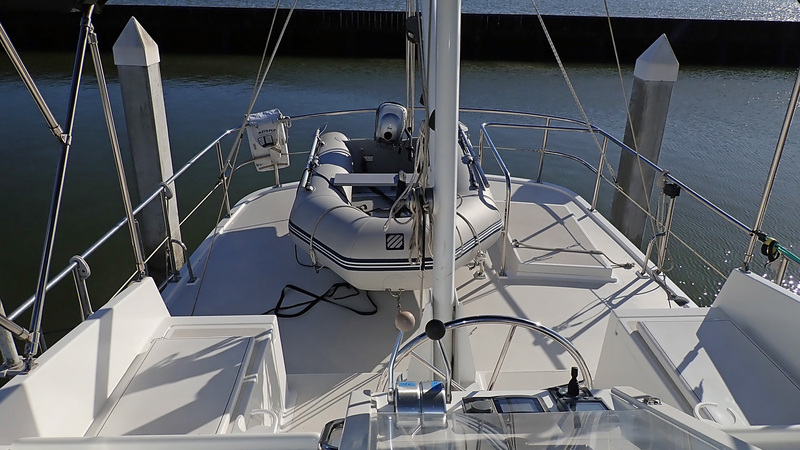 The Krogen 39 is no longer in production, the costs to build them became to high and so there are only about 50 hulls sailing the seven seas. 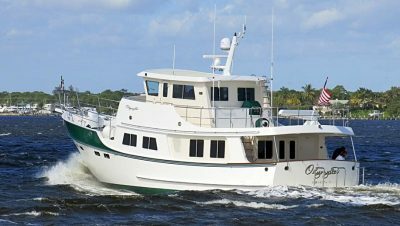 A true full displacement, long range trawler, she is an ideal cruising platform for an adventurous couple. 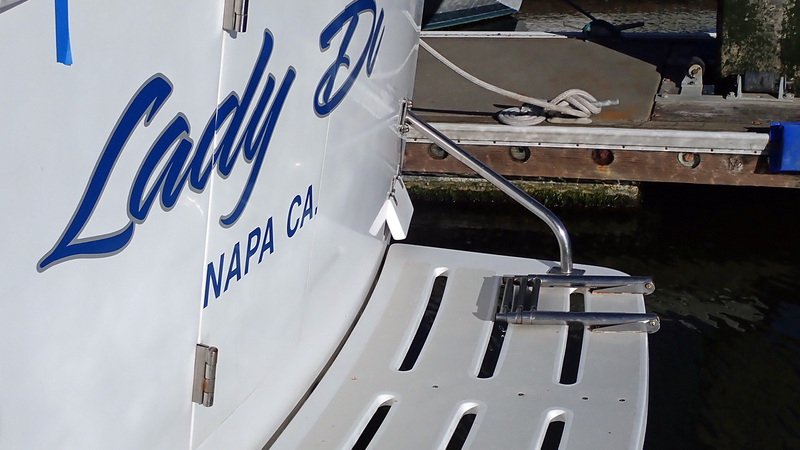 During her career, Lady Di has covered the US west coast down south to Mexico and up north to Alaska. 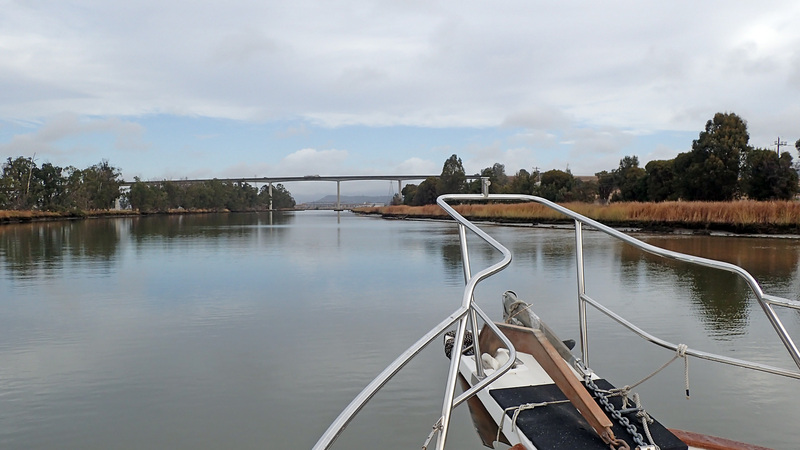 She has been on the San Francisco Bay for the past few years and now resides in Vallejo, CA home of the California Maritime Academy. 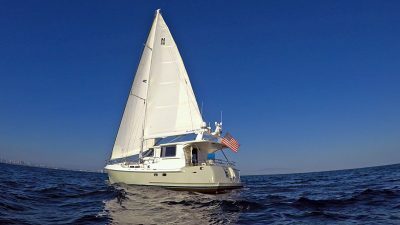 Provisioned and topped off with fuel she is a few short miles away from clearing the Golden Gate with a virtually unlimited itinerary of blue water to explore. 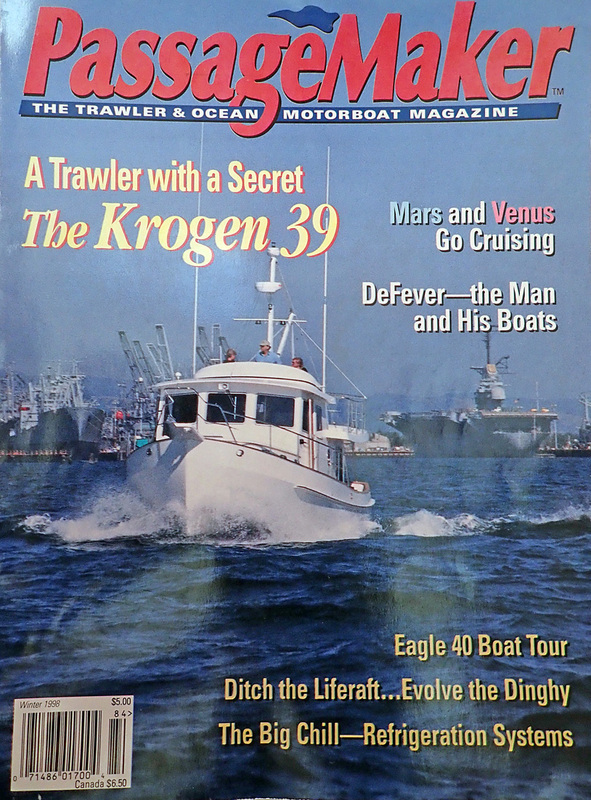 The Krogen 39 lives up to the Kadey-Krogen marketing slogan, “At Home On Any Sea”. 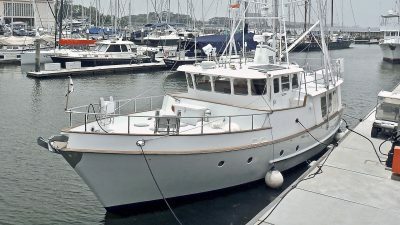 Sharing the rugged good looks of her siblings, the Krogen 39 is often mistaken for one of her larger sisters, especially when perspective is difficult offshore. 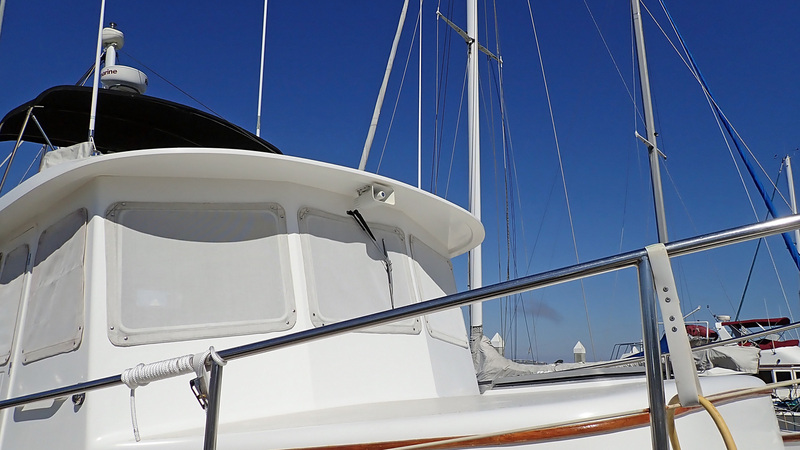 The high bow keeps her dry at sea and she is gracefully proportional, everything is just right. 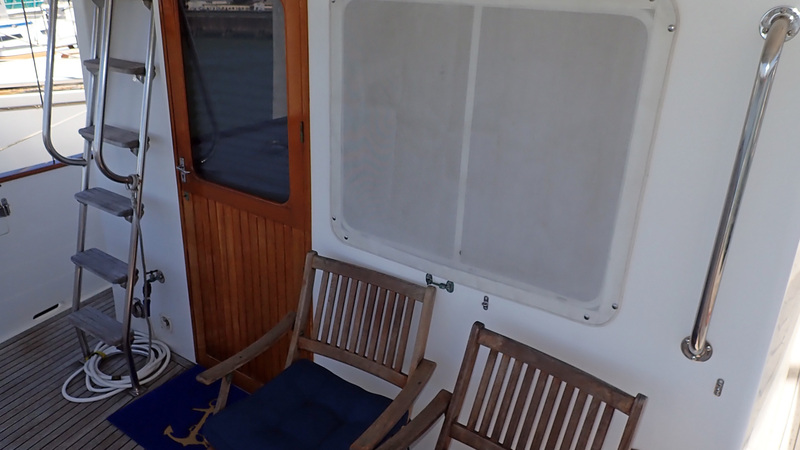 Boarding aft (from the swim step or dock) you enter the cockpit which is covered overhead and includes teak decking underfoot. 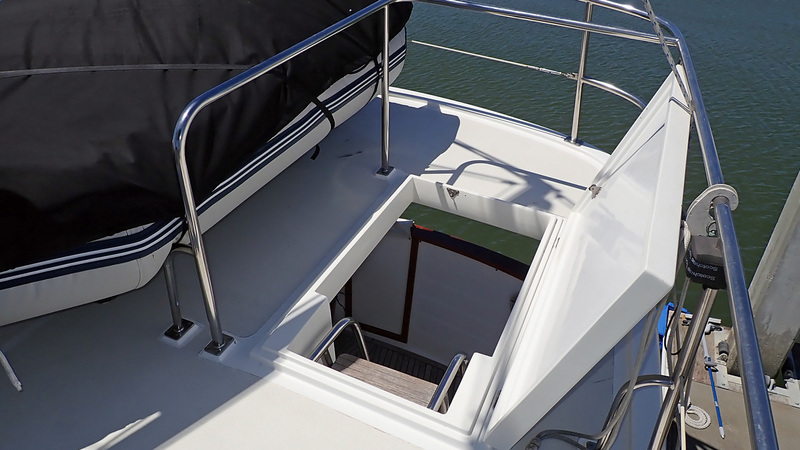 The cockpit has a ladder for access up to the boat deck and flybridge. 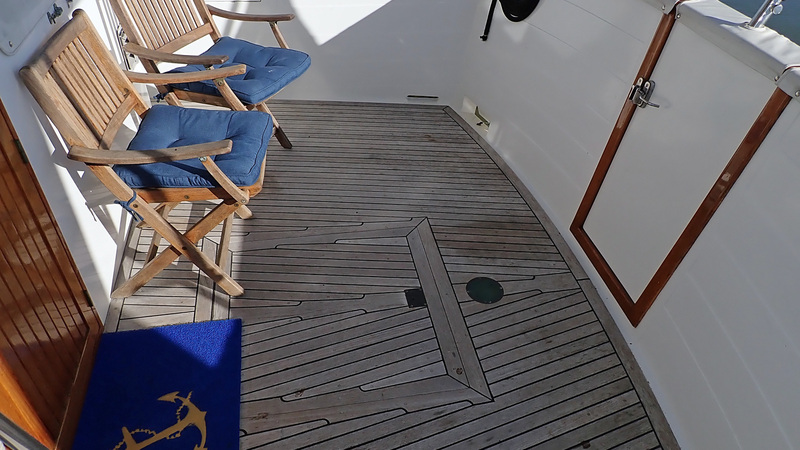 From the cockpit going forward there are teak side decks port and starboard (covered) that merge into fiberglass steps that lead up to the foredeck. 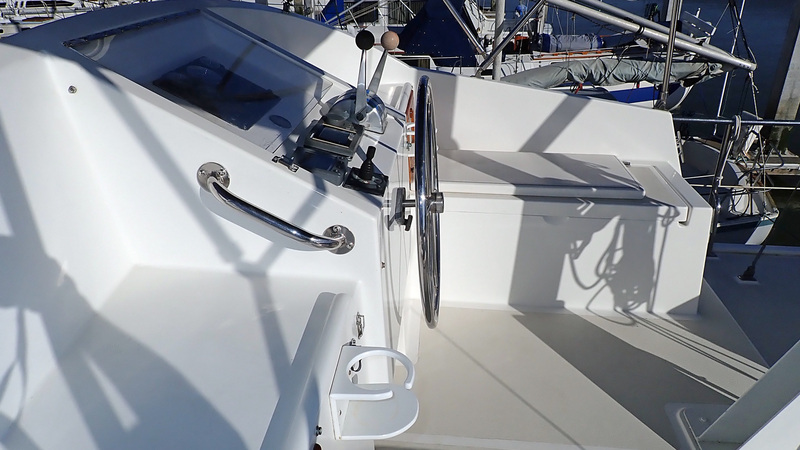 The foredeck has stainless safety rails and a horizontal electric windlass with a complement of anchors and assorted ground tackle. 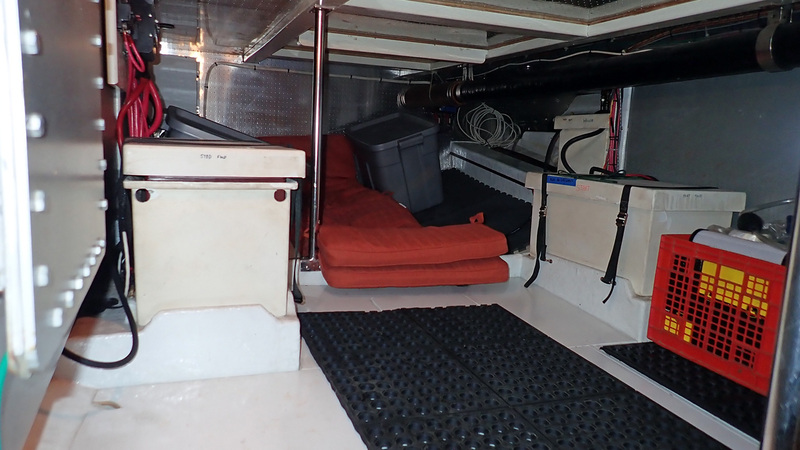 The boat deck is above the cockpit and connected by the ladder that has a hatch covering for safety. 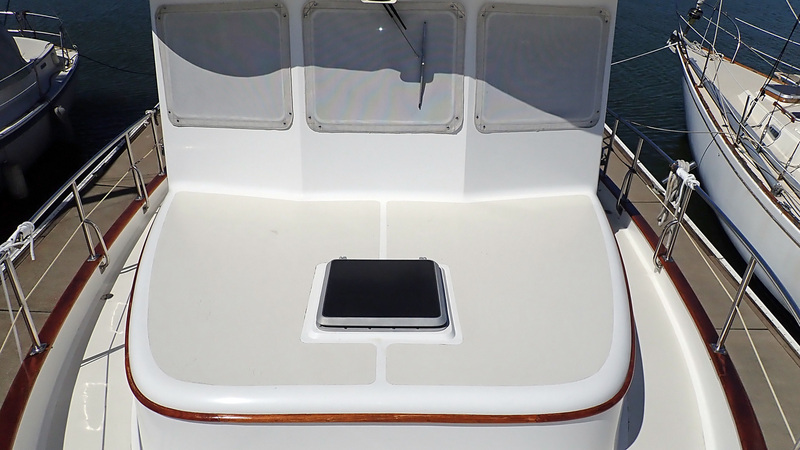 Her RIB tender dinghy is mounted fore / aft (guarding the hatch with a stainless pen). 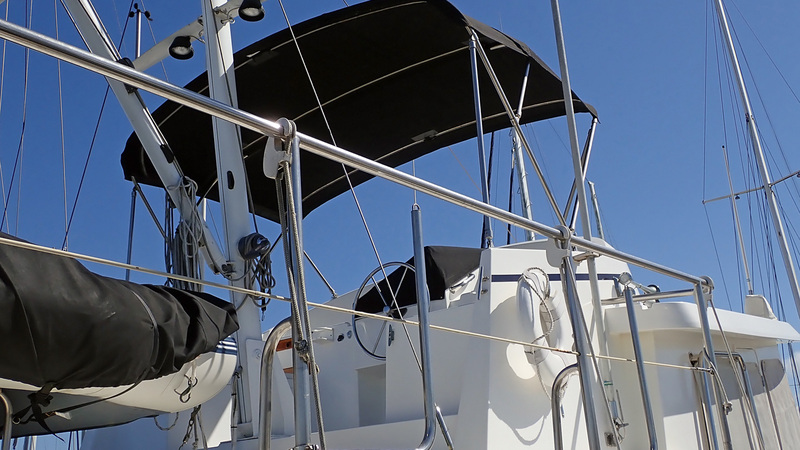 The painted aluminum spar arrangement provides antenna mounting on the mast, and the boom serves as the dinghy launching davit. 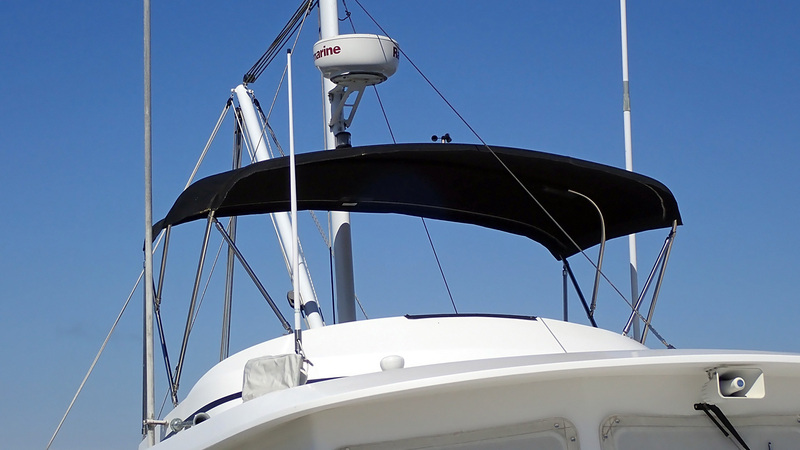 Forward and up on top, the flybridge has a folding canvas Bimini cover. 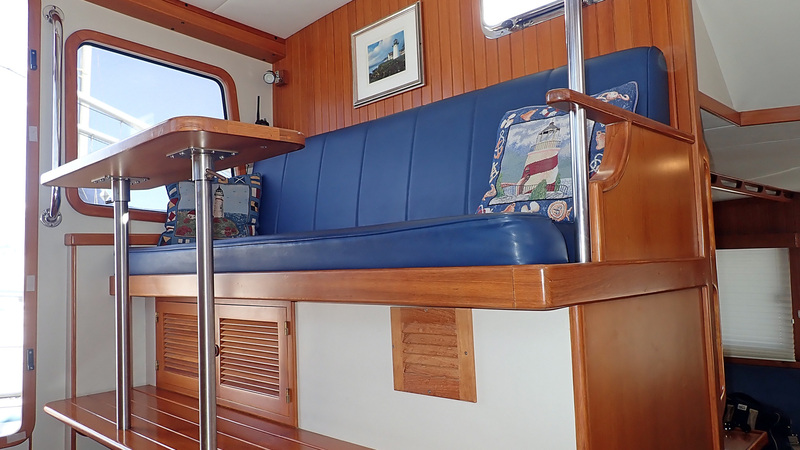 There is outboard bench seating on each side. 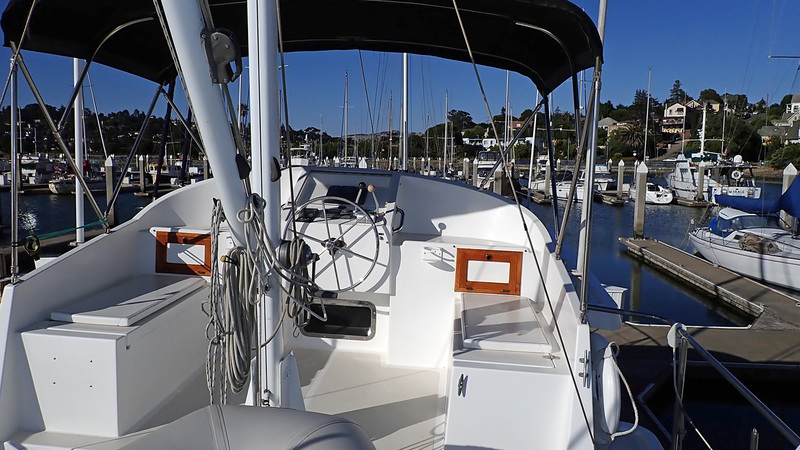 This is an ideal location for cruising on a sunny day or for relaxing safe in harbor with a spectacular view. 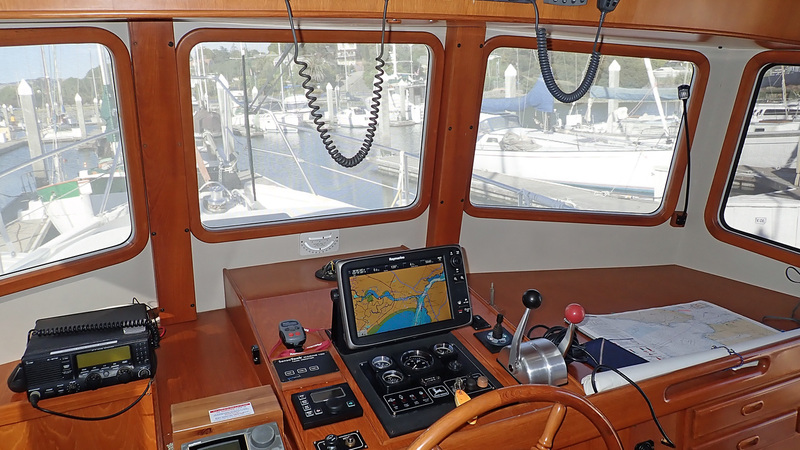 You can steer the stainless-steel destroyer helm, thrust the bow and monitor basic navigation electronics from this perch. 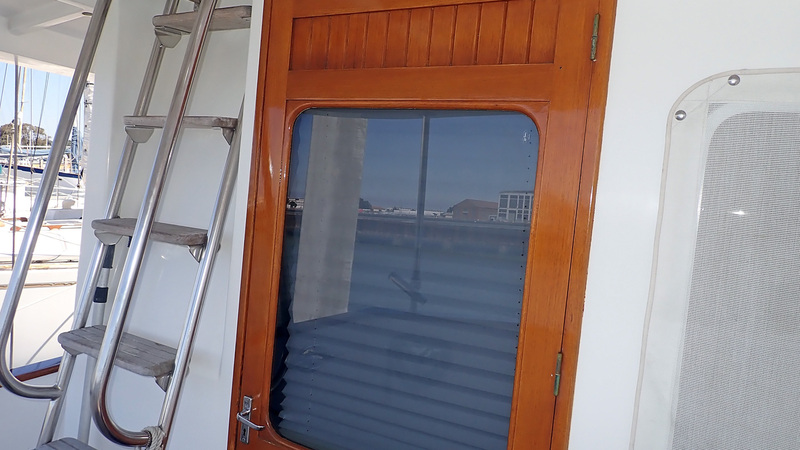 Entering through the saloon door from the cockpit, you will appreciate the fantastic visibility to the outside through teak framed opening windows and will be greeted by a warm teak interior. 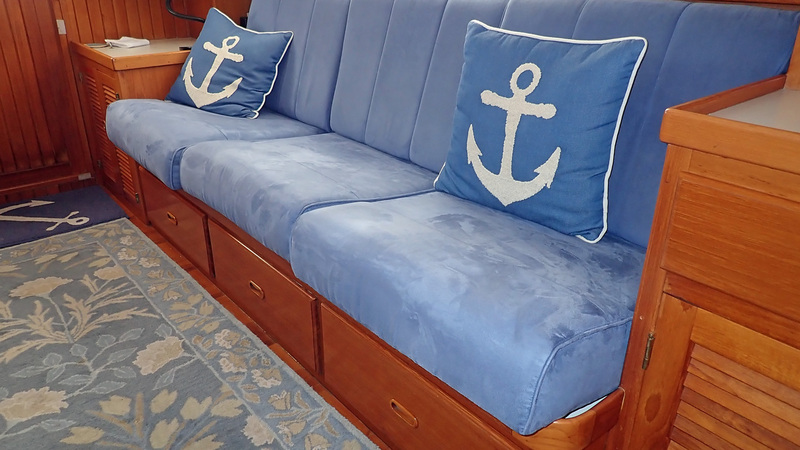 There are built in settees port and starboard with comfortable Ultrasuede upholstery and a teak parquet floor. 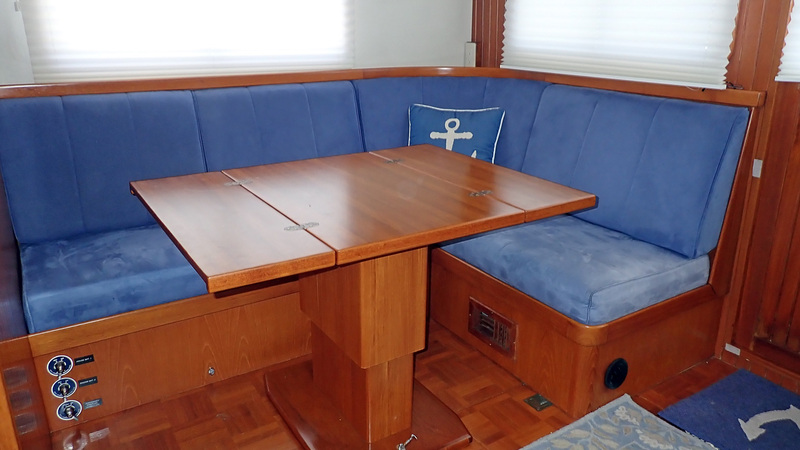 The dining table is a teak high – low that can be easily tucked away while offshore or repositioned outside in the cockpit. 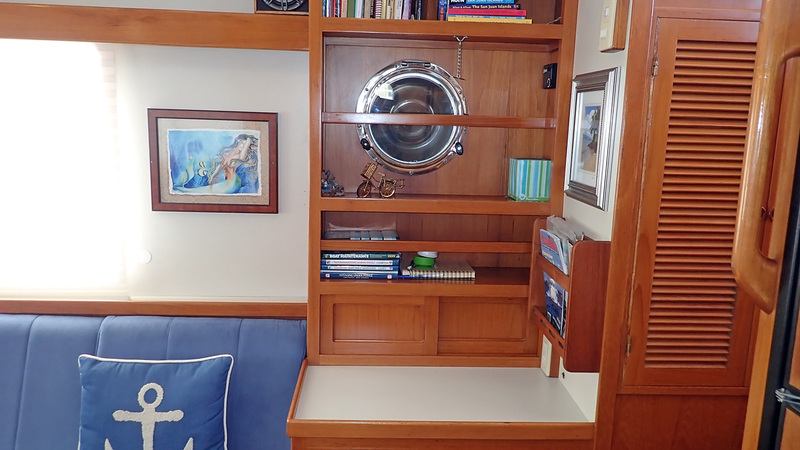 There is a built-in bank of drawers with a counter surface forward to port and the steps here lead up to the pilothouse. 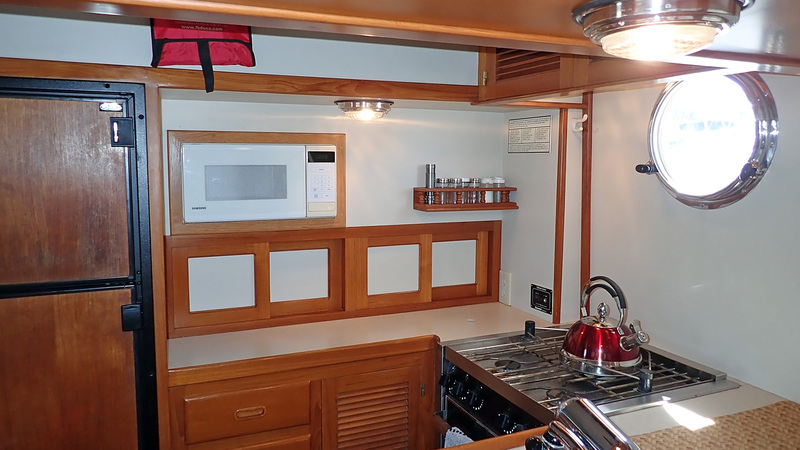 The galley is forward to starboard lined with white Corian counters and white laminate verticals to keep it light and easier to clean. 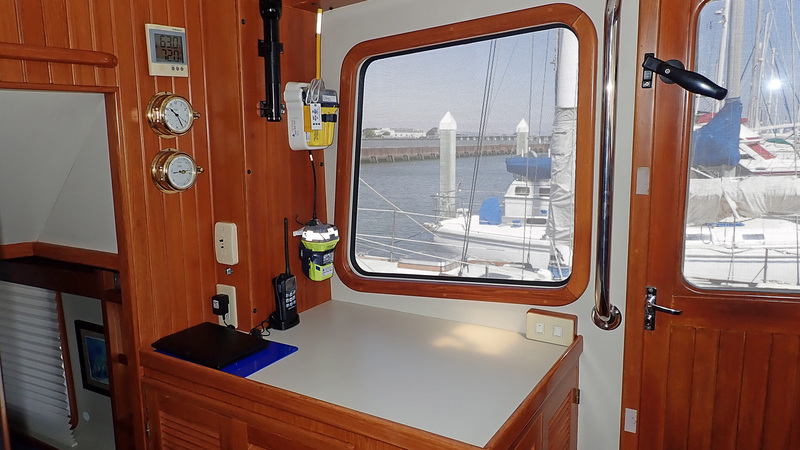 There is an opening portlight outboard to provide both a view and ventilation. 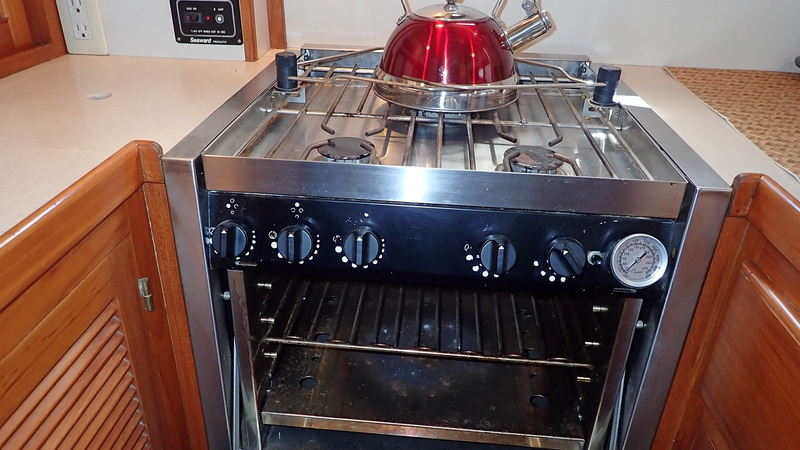 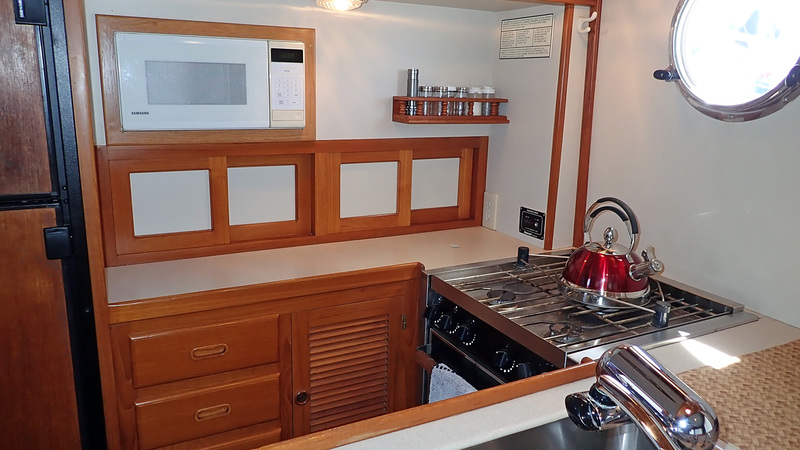 The galley includes lockers and drawers, a tall refrigerator, large sink, stove and oven plus microwave for easy and satisfying meal preparation. 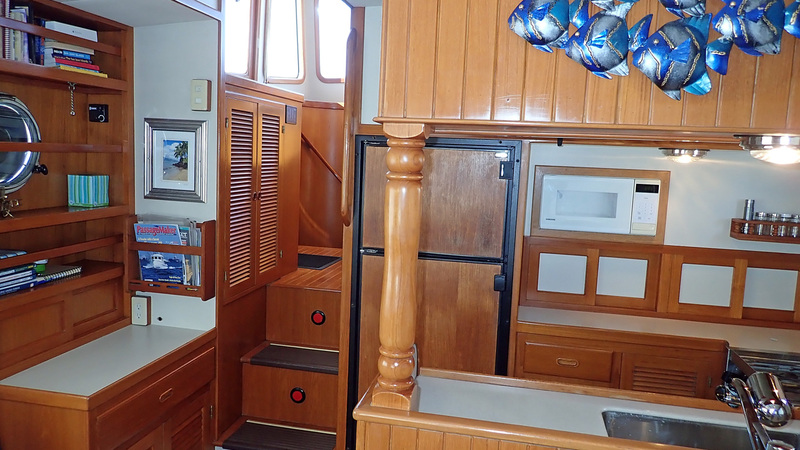 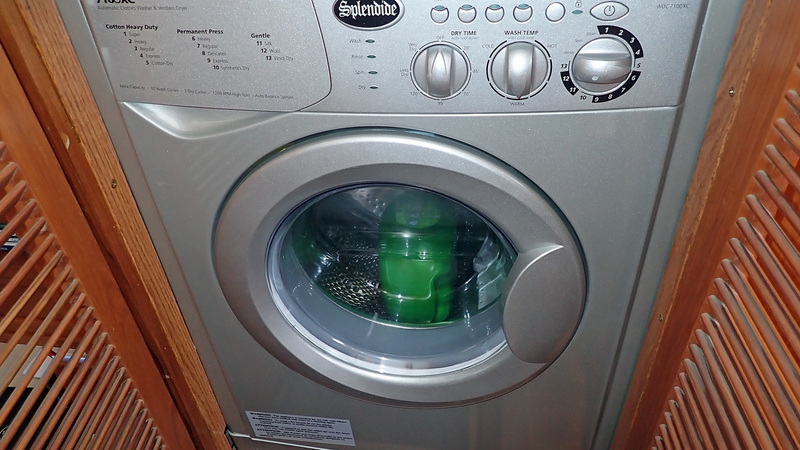 Moving forward and up the steps to the pilothouse, you pass an outboard locker with a louvered door that conceals the combo clothes washer/dryer. 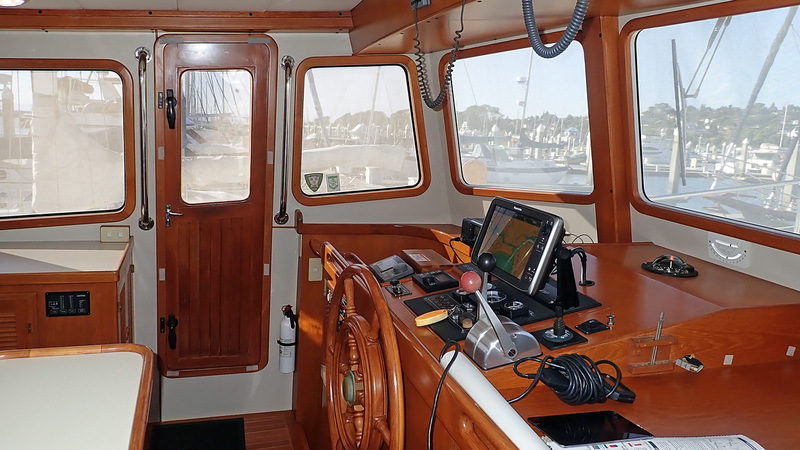 The pilothouse has an impressive view making operations underway very easy to manage and includes doors to the outside decks port and starboard. 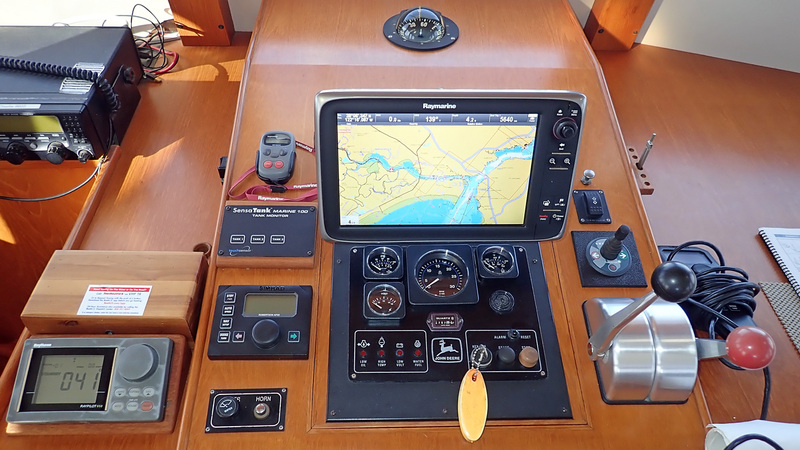 There is a wide and comfortable settee with a table aft, and the forward nav/com dash has an appropriate concentration of navigation and communications electronics and features a large teak steering wheel on centerline. 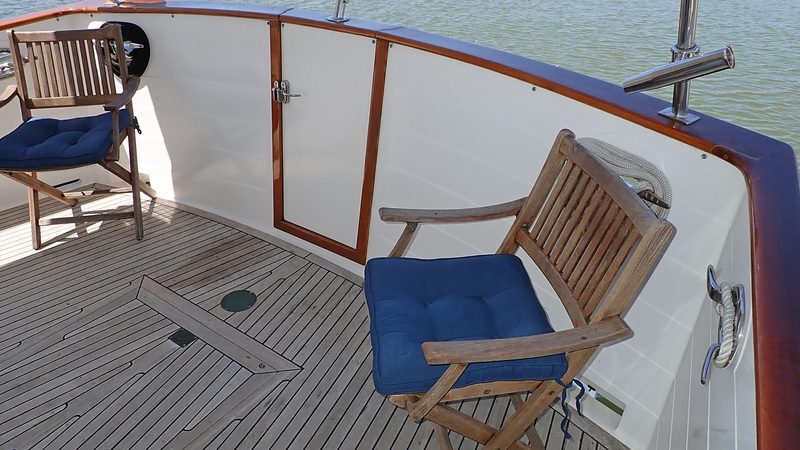 The flooring is teak and holly and the rich teak joinery in the pilothouse is complemented by white surfaces and white overhead with an opening hatch. 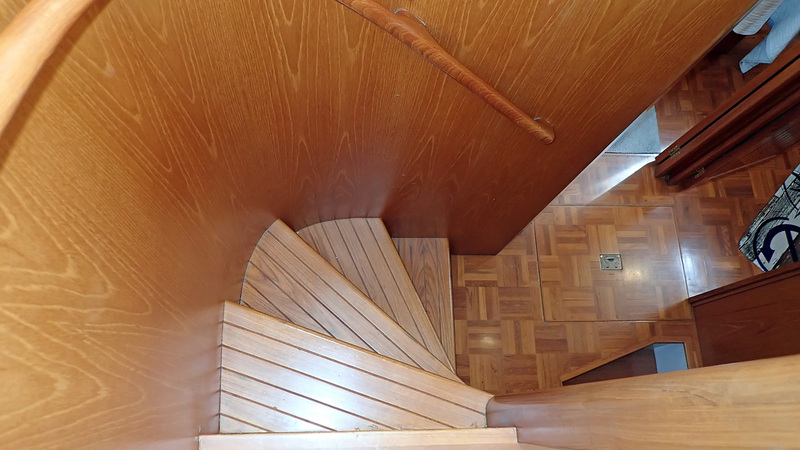 Taking the stairs that curve to the lower level you reach a landing that allows you to go forward to the master stateroom, outboard to starboard to the head and shower, or aft to the engine room. 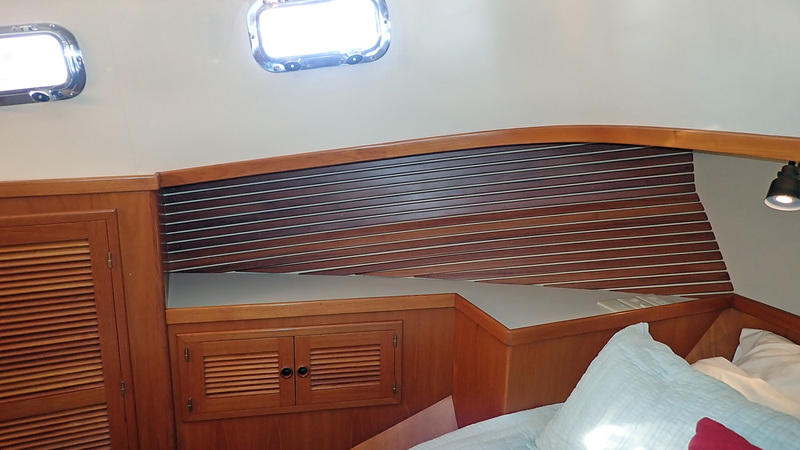 The full beam master with island queen sized walk around bed is surrounded by teak lockers and doors. 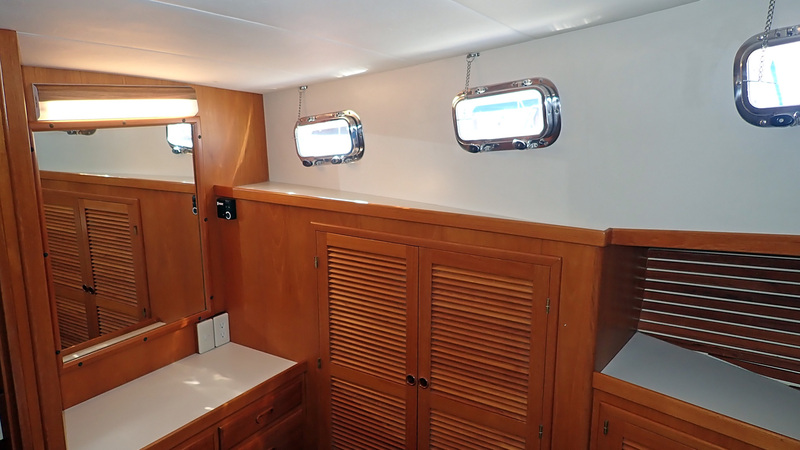 Varnished teak ceilings outboard combine with white laminate to make this room feel spacious and an overhead hatch plus outboard opening portlights provide ventilation. 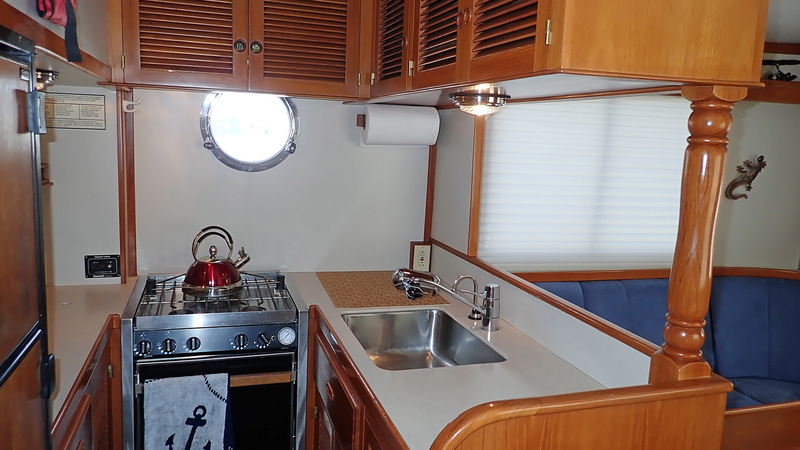 The head and shower include a sink basin and is surprisingly roomy and convenient for anybody aboard. 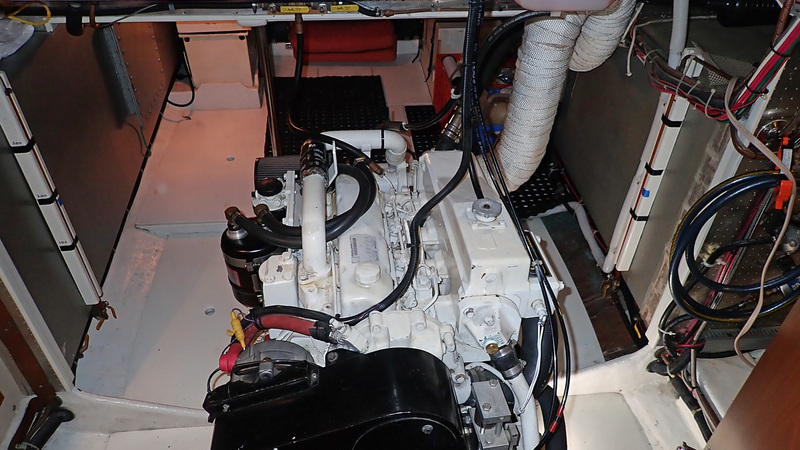 The engine room is under the saloon and has stand up 6’ plus headroom as you enter and plenty of access to move around once inside. 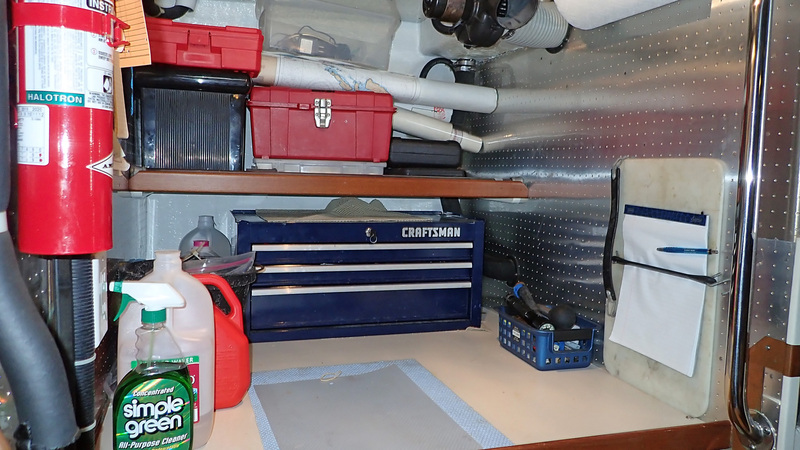 There is a work table area with a tool box and room for storage of oil, filters, etc. 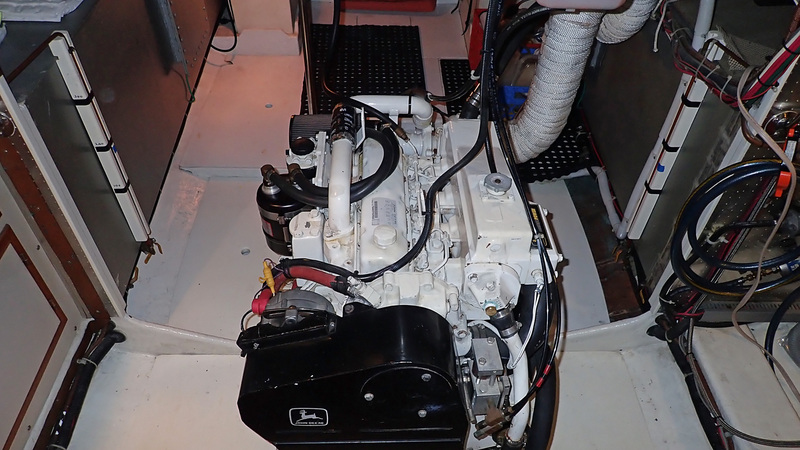 She is powered by a John Deere main engine. 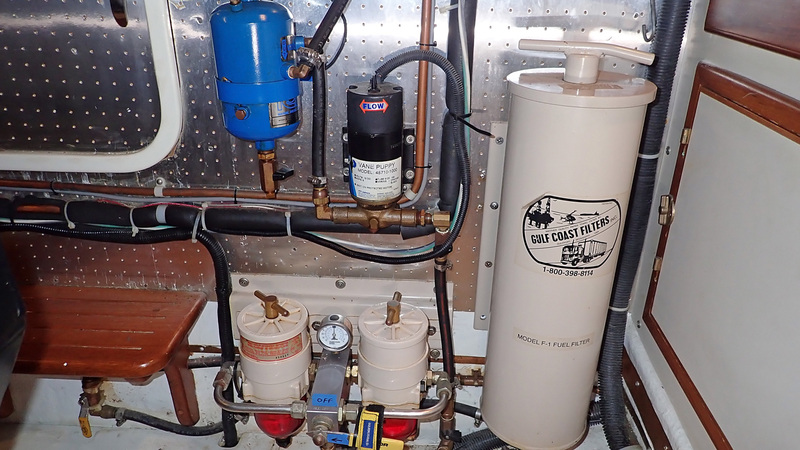 Neat installations of machinery and hose runs show the care in her construction and the foresight for easy servicing and maintenance. 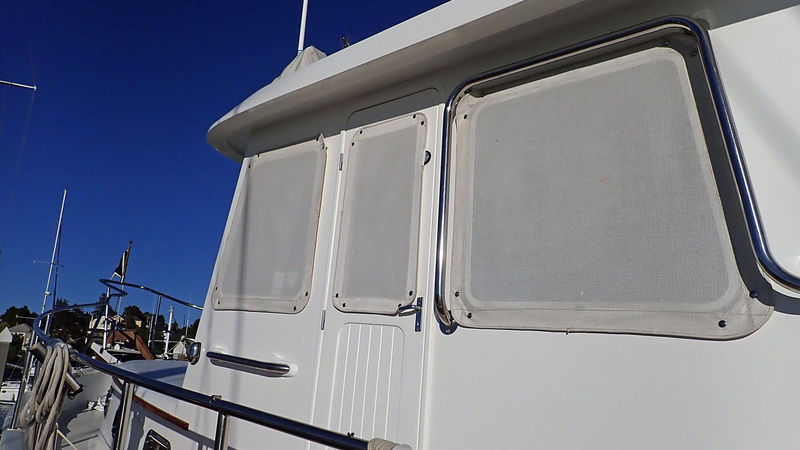 are evident. 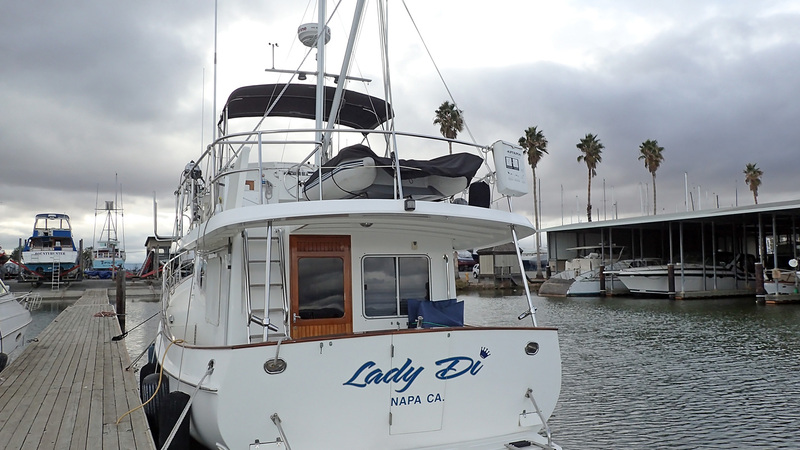 Lady Di is a “secret” you need to see for yourself to truly appreciate. 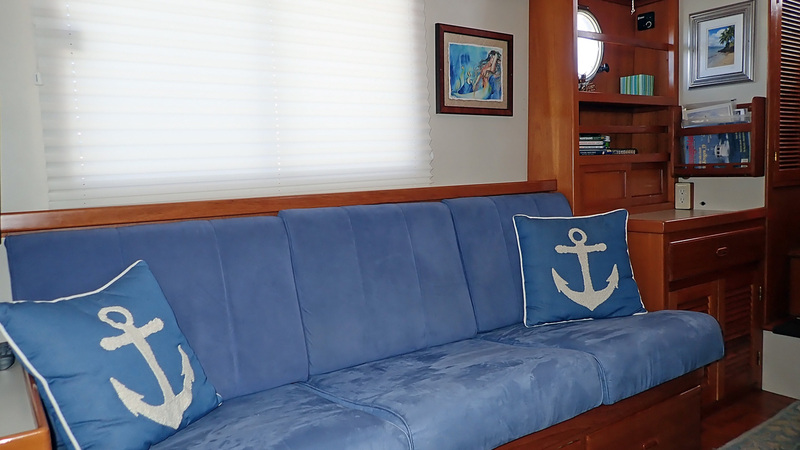 Please contact the listing broker for a visit as all showings are by appointment only. 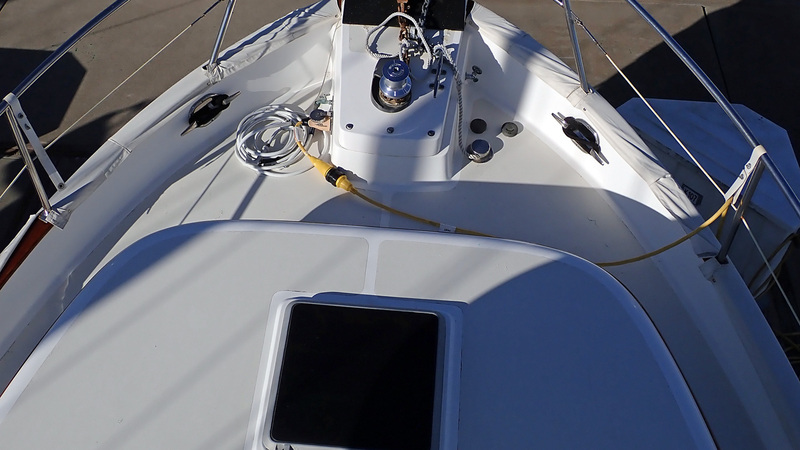 Note: Propeller is pitched for efficiency not for full RPM at wide open throttle. 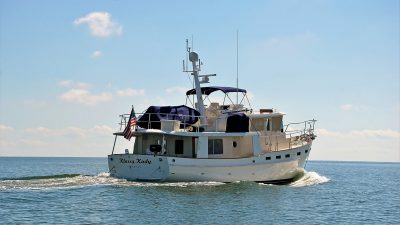 Watch a video of the Kadey-Krogen 39 – Lady Di below.